Hello! Today for Lawn Fawn Inspiration week we are playing with the latest installment in the Let's Polka line of papers, Let's Polka in the Meadow. Beautiful bright colors perfect for spring! 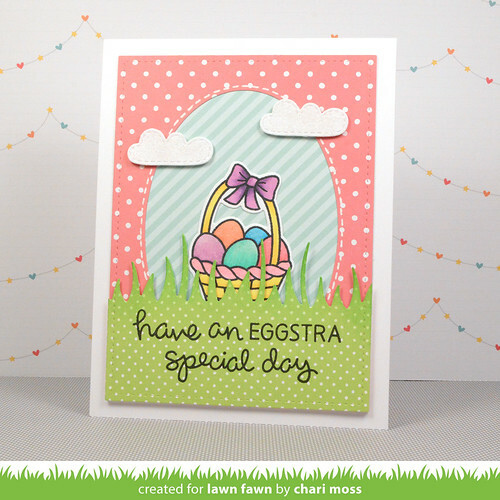 Thinking of spring and Easter just around the corner I used the Let's Polka in the Meadow papers to create this bright Easter card. I cut a pink polka dot stitched rectangle then cut out an oval inside creating a frame. Then I layered it overtop of the blue stripe paper. I used the Meadow Border die to cut the green paper and added some Freshly Cut Grass ink to the edges of the blades using a foam blending tool. I colored the easter basket from Eggstra Special Easter with copics and added some sparkle to the eggs with a clear Spectrum Noir sparkle pen. I finished off with a couple sparkly clouds overlapping the frame. Check out the Lawn Fawn Blog for more Let's Polka in the Meadow projects! Hey there..!! Nice post..Copic Sketch Markers are double-ended, with a Medium Broad nib at one end and a flexible ... Extend the life of your markers with COPIC Various Ink Refills! 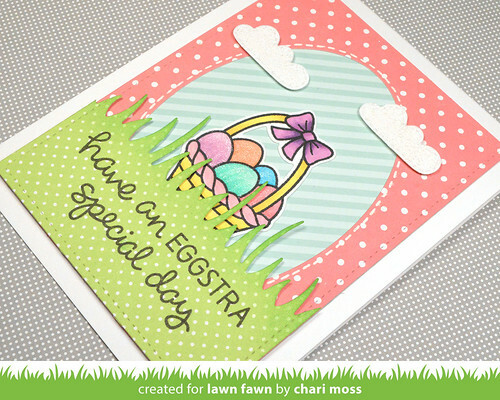 Thanks for sharing this post with us..
Chari this card is great. I know a few little ones who would love to get this.